Organic dentistry, often also called natural or holistic dentistry due to its emphasis in maintaining a natural environment within your mouth, shares a number of similarities and differences with traditional dentistry. While a dentist that practices pediatric organic dentistry and one that follows a traditional dental path both want their patients to have healthy teeth and a great smile, their methods to achieve these goals tend to be vastly different. Understanding these differences can help you appreciate them. Dentists that focus on pediatric organic dentistry approach the dental care of their patients from a holistic angle. That is, these dentists emphasize how important proper dental care is to the whole body and vice versa. Numerous studies have shown a link between poor dental health and an increase in heart disease, diabetes and other serious health conditions. 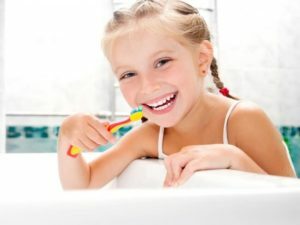 By utilizing the mindset that keeping the mouth healthy helps to keep the body healthy as well, pediatric organic dentistry can be effective at protecting both the long and short-term health of patients. In spite of many traditional dentists as well as the FDA maintaining that mercury fillings are both safe and effective, pediatric organic dentistry chooses a different thought process. Mercury is a toxin even in small doses and using it within such a vulnerable environment such as the mouth where the tissues so easily absorb elements exposes patients to an unnecessary risk. This risk is particular harmful to children due to their vulnerability. Since they are still growing and developing, any exposure to toxins, such as mercury, could set up a lifelong disadvantage. Fluoride is another element that is toxic if ingested. There have been studies that suggest that ingesting fluoride, such as within the water supply, has no effect on the health of the teeth. In other studies, ingesting fluoride in this manner has been linked to issues with the bones as well as cancer. Some dentists who practice organic dentistry use topical fluoride as a way to protect the teeth while others do not. Dr. Saadia Mohammad has provided pediatric organic dentistry as well as a number of other dental services to the children within the Boca Raton area since 1998. Her state-of-the-art facility and caring, personable team make giving your child the best smile he or she can have an experience that benefits the entire body.